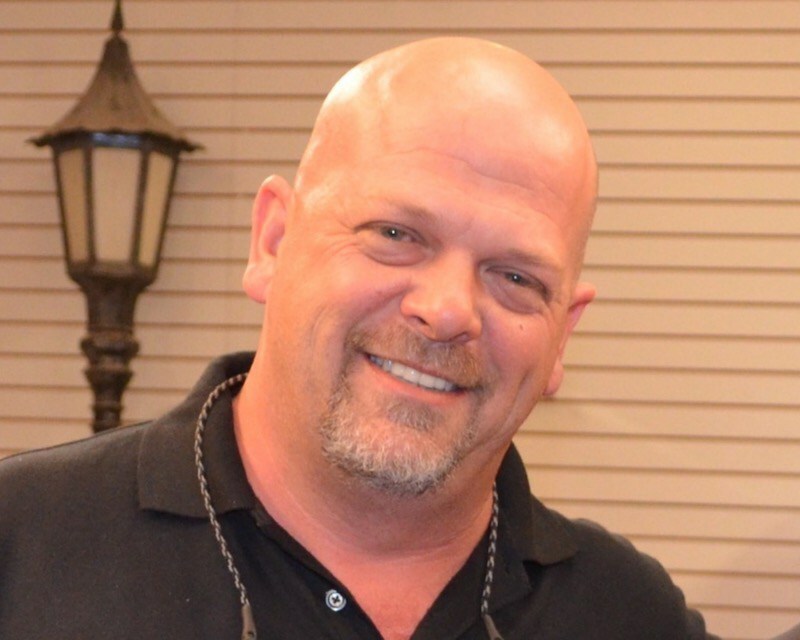 Recently, a number of people wrote to me asking what I thought about the announcement that the star of the History Channel’s “Pawn Stars”, Rick Harrison, was autographing the insert for Numismatic Guarantee Corporation holders. I do not believe there should be a problem with this. Previously, I wrote about something I called “numismentos,” mementos created from numismatic items. It was prompted when NGC announced they struck a deal with Edmund C. Moy, the 38th Director of the U.S. Mint and currently the last full-time director, to autograph labels. I also noted that NGC also had autograph deals with Elizabeth Jones and John Mercanti, the 11th and 12th Cheif Engravers of the U.S. Mint, respectively. You can see the list of available NGC Signature Labels here. But NGC is not the only one in this game. Professional Coin Grading Service has had similar promotions including Philip Diehl, another former Director of the U.S. Mint and a long list of Baseball Hall of Fame inductees who signed labels used in the encapsulation of the 2014 National Baseball Hall of Fame commemorative coins. 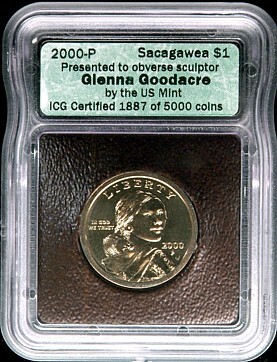 Famously, Glenna Goodacre, who was paid $5,000 for her design of the Sacagawea dollar, asked to be paid in the new dollar coin. She sent the coins to Independent Coin Graders to be encapsulated with special labels. Goodacre then sold the coins at a premium. She did not sell out of these coins. Later, about 2,000 coins were acquired by Jeff Garrett who submitted them to PCGS. The coins were encapsulated with a special attribution on the PCGS label and included an insert with an autographed by Philip Diehl. ICG also had some of the designers of the State Quarters autograph labels. Does anyone else remember when the original PCI was still in business and they hired J.T. Stanton as company president and they had him autograph labels of coins he graded? Although all of the grading services include special attribution for coins, NGC and PCGS have special labels that they use for certain coins. In all cases, these grading services are creating these numismentos for customers interested in having the label be significant to their collection. The only problem I have with the label designation is the “First Strike” or “First Strike” labels. There are questions as to the validity of these designations that causes an unnecessary premium to be added to these coins. Besides, If I took any other stance, I could be accused of hypocrisy. In a few cases, I have purchased numismentos. My collection includes a pair of ICG holders with 2001-P and 2001-D New York State quarters autographed by designer David Carr that is part of my New York collection. As part of my Bicentennial Collections, I own a Bicentennial PCGS Signature set. 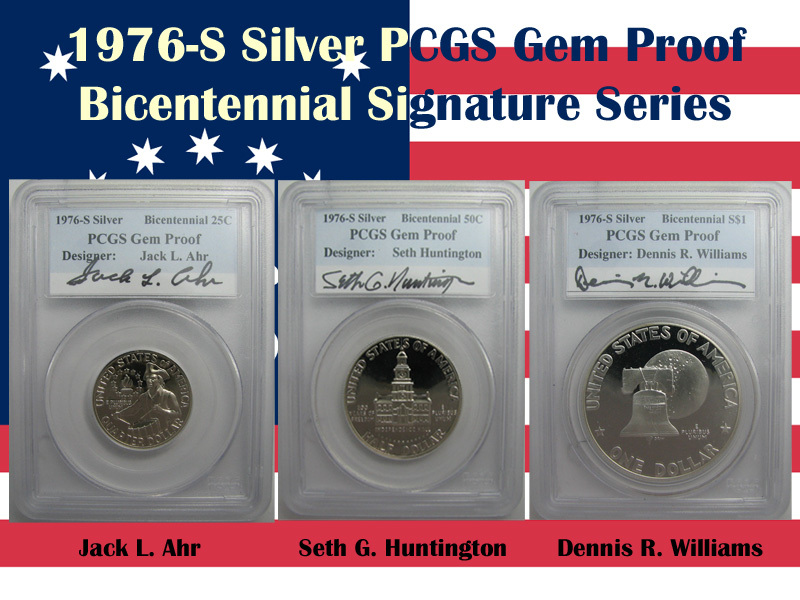 The set consists of the three proof coins with the special bicentennial reverse in PCGS slabs with the autographs of Jack L. Ahr, Seth Huntington, and Dennis R. Williams, the designer of the coins. There is a business strike version of this set but I find the proof coins more appealing. The only reason that there appears to be some umbrage taken with the autograph by Rick Harrison is that he is a relentless self-promoter whose style is not welcome by everyone. Harrison is not the first non-numismatic-related celebrity to autograph inserts but may be the most controversial to some people. As I have previously suggested, we can call these types of numismatic-related collectibles numismentos. Numismento is a portmanteau of numismatic + memento. I suggest the name to distinguish collecting the coins from collecting the slabs, show-related ephemera, buttons, or anything else that is not numismatics. If collecting numismentos makes you happy? Enjoy yourself!